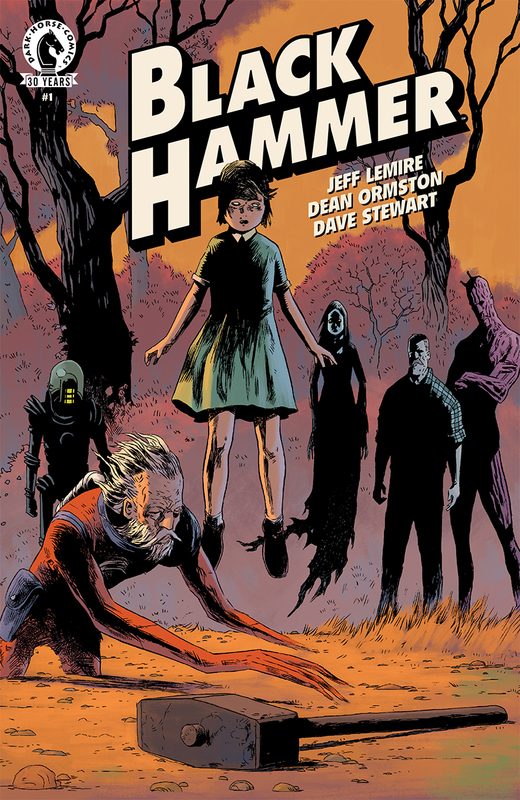 Black Hammer – a creator-owned series from writer Jeff Lemire and artist Dean Ormston – has been on the comic world’s collective radar for quite some time now. Boasting some stellar visuals from Ormston and colourist Dave Stewart, as well as a fascinating premise courtesy of the prolific Lemire, the series was delayed slightly due to some significant health issues on the part of the artist, but is finally ready to hit shelves on in a few short weeks on July 20th. After being able to take an advance look at the first issue, we absolutely fell in love with this creative and character-driven take on the world of super heroes, and were fortunate enough to be able to sit down and have a chat with Lemire about what readers should be expecting from the series. BIG COMIC PAGE: For our readers who might not be aware, could you give us the quick “elevator pitch” for BLACK HAMMER? 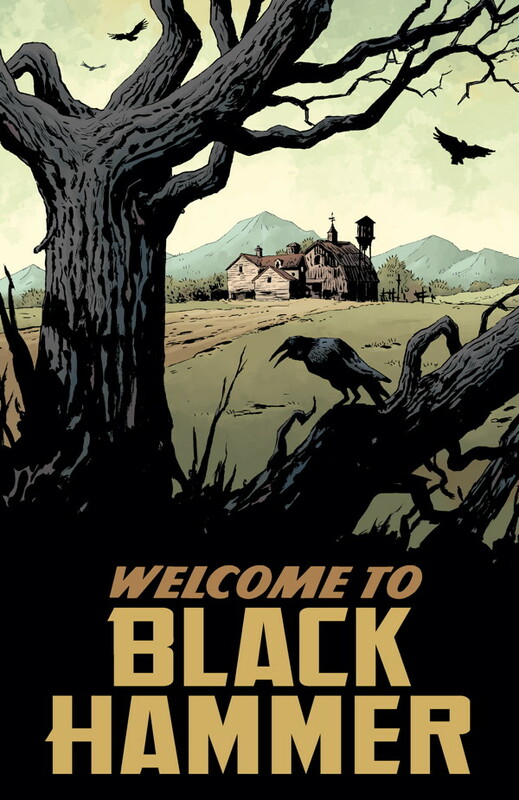 JEFF LEMIRE: Black Hammer follows the lives of 5 superheroes who have been “wiped out of continuity” and a universe shaking event and wake up on a farm in a small town and discover that they can’t leave. So our story picks up 10 year later and they have integrated themselves in the town and have hidden their true identities, blending in as much as possible and living a strange surrogate family. BCP: Can you give us a quick roll-call of the former heroes living on the Farm? JL: We have different heroes representing different eras of comic book history: Golden Aged crime buster, ABRAHAM SLAM, interstellar adventurer COL. WEIRD and his robot sidekick TALKY-WALKY, BARBALIEN warlord From Mars, GOLDEN GAIL, America’s super-sweetheart and MADAME DRAGONFLY, mistress of the macabre. BCP: Do you have a favourite out of the bunch? Someone in particular the readers should be keeping an eye on? JL: Golden Gail seems to be everyone’s favourite. Issue 2 is Gail focused and, I think, expands upon her in a really great way. I loved the tragedy and humor that could come from the idea of a 55-year old woman trapped in the body of an 8-year old. She still has all the desires and needs of an adult woman, but can’t act on most of them. This is incredibly tragic, but also, at times. Pretty funny as well. 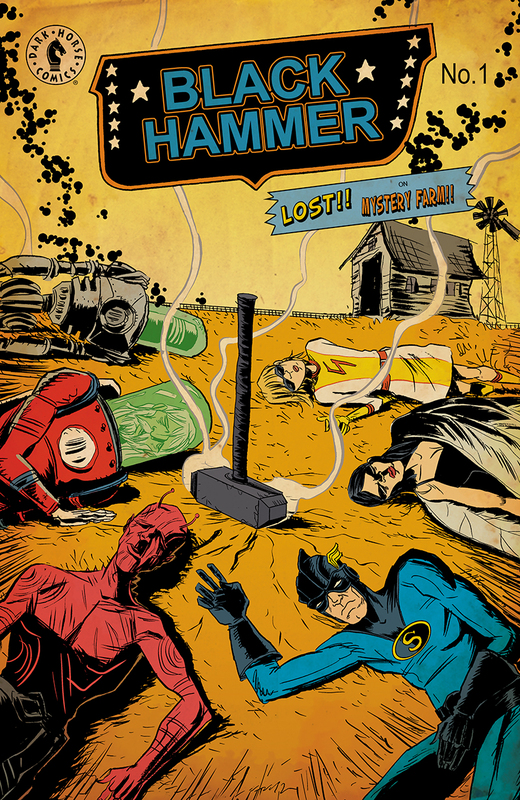 BCP: What do you think sets BLACK HAMMER apart from the glut of other comics on the shelves these days featuring superheroes? JL: This isn’t really a super hero comic. It’s a character study and the story of a family. It also comments and reflects on exactly what you just said, the glut of super heroes everywhere. You don’t need to like super hero comics to enjoy Black Hammer. BCP: You’ve written a lot of quote-unquote“regular” superhero titles over the years. What prompted the decision to take a look at these men and women removed from their capes and cowls? JL: I actually came up with Black Hammer back in 2007-2008 as I was finishing my Essex County graphic novels. At the time I planned on doing it as my own next graphic novel that I would write and draw. Back then, I was still only doing indie comics and I never anticipated a day when I would actually be working on mainstream super hero comics like I am now. So Black Hammer was sort of my way of expressing my love for the super hero genre, but filtering it through my own indie style. Then, as things developed in my career, Black Hammer got put on the back burner so I could focus on doing Sweet Tooth at Vertigo. And, that also led to me writing a lot of mainstream super hero comics since then. But I never forgot Black Hammer and would pull it out and tinker with it once a year or so. But it became obvious that I would never have time to draw it myself, with all the other projects I have lined up to draw now, so I started thinking of doing it with a collaborator. So, while it still remains a love letter to the super hero genre, I’m adding my own experiences working into super hero books into the mix of that original concept now too. BCP: What kind of tone are you looking to hit with the series? Is this going to be light-hearted, serious, or somewhere in between? JL: It’s a bit of everything. It’s serious, sad and mysterious, but it also has a healthy dose of humor. The humour just came out of the characters. This is one of those books where I sit down to write and it just writes itself. It’s more like the characters are speaking and I just write it all down as fast as I can. I love these characters and this world so much, it’s a joy to enter it for me. It’s probably the most balanced work I’ve done in that there is humor, sadness, drama and mystery in equal doses. But you’re right in that Black Hammer has more humor in it than any of my previous work. My work tends to be pretty serious, but people that know me, know that I’m not nearly that serious in person, so it’s fun to be able to inject some fun and humor into this book. BCP: Do you have a set number of issues in mind for this one, or is it an ongoing story that’s going to keep running so long as you have ideas for it? JL: Black Hammer is an ongoing series. I already have 18 full scripts written! BCP: How has it been working alongside Dean Ormston and Dave Stewart on the book’s visual side? JL: Dean was one of the first artists I thought of. I’ve loved his work since his “Books of Magick: Life During Wartime” series at Vertigo and had the chance to meet him at a comics festival in Leeds a few years back. Luckily Dean liked the project and came on board. I think we are certainly playing off of certain super hero archetypes, in terms of the visual approach, but filtered through Dean’s singular style these became something else entirely as well. And then adding Dave Stewart to the mix pulls it all together. BCP: How involved were you in things like the character design? Were you fairly hands-on, or did you just let Dean do his thing? JL: That was all Dean. I had done sketches and art for the book back in 2008. I showed those to Dean, but told him to take what he wanted and then make it his own. So what ended up in the book was really very different from my original incarnations, and much better. BCP: And finally, if you could say one thing to reader who wasn’t sure about picking this one up in order to convince them,what would it be? JL: I think I can honestly say that Black Hammer is one of my favourite things that I’ve ever done. It combines everything I love about mainstream and indie comics all into one world filled with mystery, humor and drama. As I said, I love this world and love visiting it, and I think all types of comic book fans can too. You don’t need to like super hero comics to enjoy it. BCP: Thanks again for your time, Jeff. As we mentioned, BLACK HAMMER #1 goes on sale everywhere on July 20th, and if you keep your eyes glued to the Big Comic Page over the next few days, we’ll be bringing you an advance review of the first issue. Trust us, folks, you do not want to miss this one.